It’s reported that consumers now swap over a billion chat messages with businesses per month. The number of users for the top four messaging apps has exceeded the top four social media networks combined. The move to messaging platforms is disrupting business communication, and chatbots are rapidly becoming a staple of digital marketing. More frequently consumers choose to interact with brands via messaging. Whether it’s to receive support or to ask questions, and plenty of businesses have now realized the abundant opportunities that messaging platforms provide. But, as businesses increasingly turn to messaging to engage with current and potential customers. It’s important that they have a solid conversational marketing plan in place in order to achieve the best results, and to use messaging platforms to their fullest potential. Here are the reasons why brands need a course of action. Brands can’t afford to provide anything but stellar customer support. Replies to customer inquiries must be quick, relevant, and perhaps most importantly, personalized. This is where messaging platforms can help. Interactions with brands that feel more conversational rather than transactional can help customers feel more valued. Businesses should think about how they can deliver content in a personalized and engaging way. The customer experience must be well-thought out. The messaging platform must align with other marketing efforts in order to be effective. 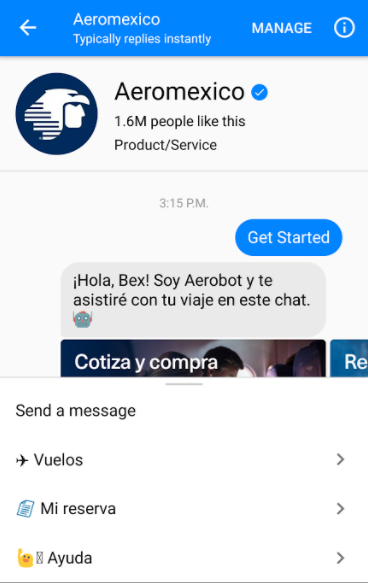 Aeromexico developed the first-ever airline chatbot to assist in making flying easier for its customers. Customers can use Aerobot on Facebook Messenger to check flight schedules and ticket prices, as well as their departure and arrival status. Aerobot has received outstanding reviews for being one of the most simple and user friendly messaging services. The airline has been able to provide passengers with valuable information very efficiently. Adding a messaging platform to an existing digital marketing campaign can seem like a formidable task. That's why it's important for brands to start small and grow their messaging offerings in line with the volume of customer interactions they're interacting with. Brands can start by promoting a single offer, or offering a single messaging channel to their consumers, in order to encourage adoption rates at a manageable rate. A routine mistake businesses make when providing customer support via a messaging platform is not specifying if the channel will be used predominately for sales or marketing. Also, they also often lack a clear workflow which determines when the marketing team will interact with users, and when the sales team will take over. A lack of a defined workflow for incoming messages can easily lead to confusion and irritation. It’s imperative to discuss the goal of your presence on a messaging platform. Including the essential benefits for the brand and how the process can be as seamless as possible. The goal of providing a private messaging service is to increase the chances of having more frequent and personalized interactions with customers. But that doesn’t mean a chatbot or messaging app is always the right way to achieve this goal. Also, encouraging visitors to your website to interact within a chat will likely feel like an unnecessary step as well. Don't overcomplicate things simply because you have the technology available. Messaging platforms should be utilized for more fluid, back-and-forth or Q&A interactions. Consumers can tell when they're being sold to, and will circumvent channels that don’t feel genuine. As mentioned, messaging platforms are changing the way brands interact with their audiences. These apps will continue to introduce new functions to help brands engage new users. Also, chatbots are helping businesses leverage their platforms in exciting new ways. Brands looking to incorporate conversational marketing into their current campaigns need a plan to be successful. As mentioned, messaging platforms are changing the way brands interact with their audiences. These apps will continue to introduce new functions to help brands engage new users. Chatbots are helping businesses leverage their platforms in exciting new ways. Furthermore, brands looking to incorporate conversational marketing into their current campaigns need a plan to be successful. Those who make each interaction authentic and personalized will be positioned to increase brand awareness and conversions.